This is the previous interview that we had with Li. A little commentary about the area that Li works in. He and his family have several stands around the Xuhui region of Shanghai down the street from the prestigious Shanghai High School, 上海中学, and East China University of Science and Technology, 華東理工大學. The following video shows a little bit about the environment and audience that Li pursued in finding his first Jianbing stand. Student’s lined up for half an hour at Li’s brand Jianbing, in this video, it is his father and mother that operate this particular stand. Youlou Village is a small mountain village located in the hinterland of the Yimeng Mountains of Shandong Province. For those who do not know, Shandong Province is located in between Beijing and Shanghai. Prior to the widespread culture of Jianbing in Chinese cities Youlou was a very poor village. Growing and harvesting honeysuckle was the main form of income for individuals in the village. Starting in the 1990’s, large waves of families and individuals started to leave the village. However, this is not the typical Chinese migration story that many people envisage; the hundreds of millions of rural Chinese people migrating to urban centers to work in large manufacturing or textiles operations where the notorious, cheap “Made in China” wares are produced. Rather, this is the complete opposite of that story. Many of the villagers of Youlou who left the village did not leave in the typical “Chinese migration fashion.” They became entrepreneurs. They spread out all throughout China, though concentrating in large cities, and became the jianbing vendors that many people know, admire, and love. 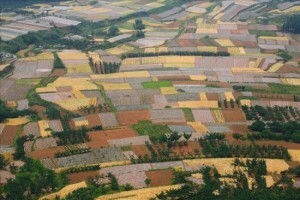 By 2004, the cityscape of Youlou had changed dramatically. Out of the 1226 people, around 362 families, whose hukou states they are domiciled within the village, well more than half had left to seek the treasures of selling Jianbing. Over a ten year period of development, the Jianbing industry exploded. This industry came out of nowhere. The, roughly, 700 Youlou villagers who had left the village were generating profits of more than ￥20 million RMB, around $4.35 million USD in 2015 values. 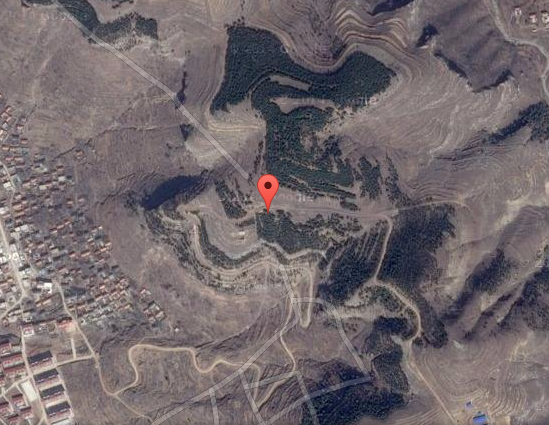 Click here and zoom in and out on this Google Map to see how isolated the village is. Li’s mother’s thoughts about the development of Youlou. Jianbing fit into the fast, casual dining culture that developed within Chinese cities. This largely contributed to the widespread success of this dish – besides the fact that is it delicious. Although the selling of jianbing allowed villagers who had left Youlou to produce quite substantial profits, a vast majority of these were sent back to their families in the village. Thus, Youlou got rich. Planning among the villagers allowed for a unified development of the village to take advantage of the millions of renminbi flowing into the city every year. Over the last few years, such planning has led to the development of 38 new buildings within the city as well as the development and upgrading of internet and telecommunications infrastructure within the region. Moreover, such funds have allowed for the maintenance and development of basic utilities such as roads, water, and electricity infrastructure within the village. Many of these basic amenities have been less well maintained and developed within the surrounding villages of the region. Leaving the standard of living for those within Youlou far better than the surrounding area. Although Li never attended the Jianbing Contests, he told me that his fastest record is 21 seconds making one Jianbing. Jianbing’s history according to Li’s mother. It was during the 1990’s when one of the Youlou villagers who had left created a new style of Jianbing. This style of Jianbing is the Shanghai-style Jianbing – it is far easier and quicker to make than the ‘original’ style. Rather than Shandong-style Jianbing which typically has a more salty character to it, the Shanghai-style Jianbing is much sweeter and plays on the tastes of the Shanghainese, and, in general, people from the south. With the Shanghai-style Jianbing obsession began. Many people came to Shanghai to learn how to make this new style of jianbing. With this new recipe in mind, Youlou villagers spread throughout the country, selling jianbing. Strictly speaking, the new style of Jianbing has only 20 years of history. The origin of this new Jianbing is actually Shanghai, not Shandong. According to Li, the Shandongese, 山东人, do not use the sweet sauce that it is now typically found in jianbing. It was for the Shanghainese people that the recipe changed. The sweet sauce that truly made jianbing such a hit in Shanghai was the sweet sauce – a base of flour, sugar, and soy sauce. Since that time, the Jianbing industry has exploded. There are now thousands of vendors selling Jianbing all around the country – many of which are Shandong residents but not from the original founding village of Youlou. Moreover, this has truly changed the landscape of Jianbing equipment. Prior to the mass demand of this street food around the country, Jianbing equipment was fairly specialized. Professionally made equipment cost in the range of several hundred USD which led to most vendors using handcrafted kitchenware. But this landscape is different now. 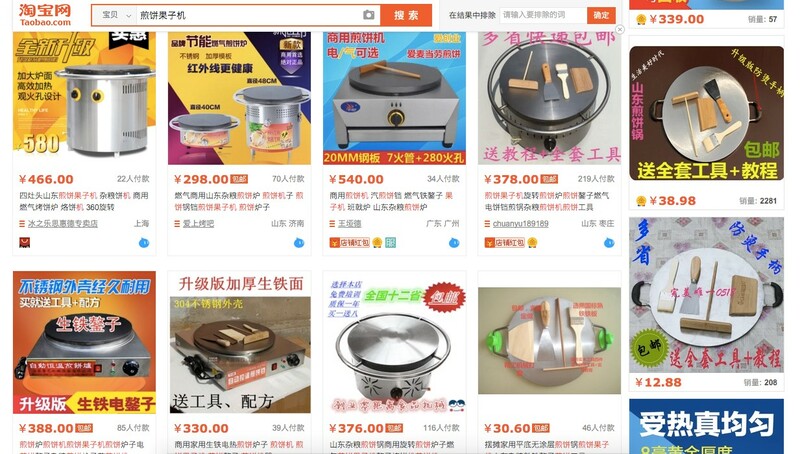 Many of the large kitchen supplies manufacturers produce their own versions of the Jianbing hotplate. As seen below, this equipment is easily found on online marketplaces, like Taobao, and are fairly inexpensive to purchase. During our interview, Li told us that while in elementary school he was embarrassed by the fact that his parents were Jianbing vendors in Shanghai. This embarrassment stemmed, not from a shame that his parents were vendors but, from the criticism and harassment that he would get from his classmates. However, this scene in Youlou has changed. The idea that families who sold jianbing were less than well off is now nonexistent. Introducing someone that “he sells Jianbing in Shanghai” now implies “he lives a decent life.” Not something to heckle someone about. Now, the jianbing industry has gone as far as to dramatically alter the social scene within Youlou. There is now a large, a growing acceptance of people marrying into jianbing selling families. Particularly for the woman’s family, there has become more willingness to allow their daughter to marry men selling jianbing since they know that this ensures they will have a fairly good life. What we now find is a consolidation of the families in Youlou. Moreover, we find that more than ever before families are now directly associated with the jianbing trade. Moreover, while talking with Li, we learned that finding a good location set up a Jianbing stand is far more difficult than many people realize. Li planned to set up a new Jianbing stand at NYU Shanghai, 上海纽约大学, campus. But upon learning that there was another Youlou vendor near to the NYU campus, Li decided to hold his stand by Shanghai High School. This was not, though, a solo effort undergone by Li. Youlou Village understands its welfare is dependent of the success of the jianbing vendors all over the country. They have put tremendous effort into a network that we call the Youlou People’s National Network. This is a large database and network of all villagers who have left Youlou to sell jianbing. It works in a similar way to Chinese-American Employment Centers in the United States that serve to place Chinese in American jobs. The Youlou People’s National Network helps the villagers of Youlou find locations throughout China to set up stands. They also have lists of recipes that that play to the different tastes of different regions throughout China. Youlou villagers, thus, have an advantage to other vendors of food. They know the good locations, the spheres of influence that different vendors in locations have, and the recipes that are known to succeed. The market research needed to enter a market has already been done; there is no need to roll the dice for a successful venture for the people of Youlou. Granted, there are market risks that these vendors face – failure is always a possible outcome. But the people of Youlou understand the importance the jianbing trade has on their livelihood. Creating this network gives the vendors of Youlou every possible opportunity for successfully starting an enterprise thereby helping turn Youlou into a greater success story. An interesting dilemma occurs for those of Youlou Village selling jianbing around the country, none of them have local hukou. Li pointed out during his interview with us that he and his family currently do not have a Shanghai hukou. Interestingly, though, for his everyday life activities, Li finds that this does not create many problems for him and his family. It is only when it comes to housing, education, healthcare, and other State funded or subsidized programs do issues really start to present themselves. Li describes this dichotomy very curtly. Li and his family make an extremely good living from the small business that they run. They have quite an impressive operation going on, they run two Jianbing stands near the Shanghai High School area (上海中学), one Jianbing stand near Xujiahui (徐家汇) as well as one Youtiao stand. From these four stands they run, the Li family makes about ￥4,000 RMB a day, about $625 USD. Over a year they make around ￥1.4 million RMB a year – a whopping $227,000 USD a year. This, coming from the most humble street food vendor we have met truly took our breath away. For those thinking about dropping out of law school, we must note that this vast success from the Li family did not come overnight. 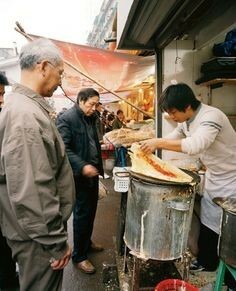 Li’s father started selling Jianbing in Shanghai over 30 years ago. 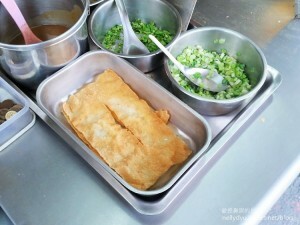 Moreover, while talking with Li, we learned that running a Jianbing stand is far more difficult than many people realize. Li gets up at 4 AM every day to sell Jianbing. Unfortunately, this doesn’t mean that Li only gets to take the morning shift at the stand. He has a huge afternoon workload that he also needs to accomplish. During the afternoon, Li prepares the Cuibing (脆饼, crispy wonton in Jianbing) and the sweet sauce needed for the next day. Li believes that the reason his food sells so well is because his materials are so fresh. This means that Li makes sure to make a fresh stock of supplies everyday without fail. Li hopes to expand his Jianbing business. Youlou is only starting to develop. We find as jianbing spreads across China and the world, it will become the General Tso of the streets.